Sorry this post took so long to write, but exhaustion was constantly upon me this last week. I'm still not over it, but working on it. 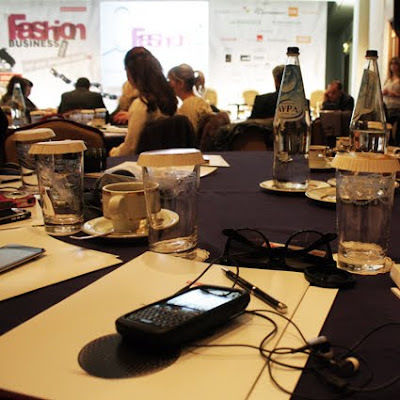 So, one week ago on Monday, we found ourselves inside a chandelier-lit room in Grande Bretagne Hotel, in order to participate in the 1st Fashion Business Forum as guests of buldoza.gr and Boussias Communications. The conference started a little after 9:00 and lasted until 18:00, so don't expect me to pass on absolutely everything that was said there. However, here is a recap of the things that managed to stay with me, according to speech title and speaker order of appearance. "The loveless relationship between Greek design and industrial production"
The legendary Greek fashion and industrial designer Giannis Tseklenis (seen in the pic above) talked about how Greece lost numerous opportunities to become a leader in the cotton and fabrics industry during the 70's and 80's due to the poor business skills of those in charge, as well as the complex state politics and bureaucracy involved. On the bright side, he still believes in young Greek designers coming through all these obstacles that remain and believes there's still hope for Greek design. "Is the luxury fashion business model broken?" The Savigny Partners investment banker William Plane who specializes in big luxury business deals, talked to us mostly about - what else - the business part of things, like the fact that merchandising is an increasingly important aspect in the contemporary fashion business models, that fast fashion / big designer collaborations aren't that profitable in money, but a great aid in brand recognition, that resort sells more because it's more wearable whereas the main collection is more theatrical and used to set a "mood" and that womenswear is an over-saturated business, whereas men customers are harder to recruit but tend to be more brand-loyal. "Fashion Leaders: Challenges and perspectives in the fashion business"
Vice President and CEO of Attrattivo Pantelis Avramidis, CEO of Adidas Group NE Europe Kyriakos Kofinas and Owner of Rakas Retail And Distribution Aris Rakas were the panel members discussing the hot subject of the dreaded crisis, the ways it has affected fashion businesses in Greece and how those businesses can overcome it. Mr Rakas very wisely said that now is the time for everyone to re-evaluate the way their companies function, cut unnecessary expences and set their priorities straight. Mr Avramidis mentioned, amongst other things, that Greece doesn't produce clothes any more, something we know for a fact that is not true. And by claiming that, I don't mean just Greek fashion designers making sur-mesure for their limited clientele, but actual mass-production fashion businesses that still chose to have wares produced here in this country. "Private Shopping - An alternative way of selling on the web?" 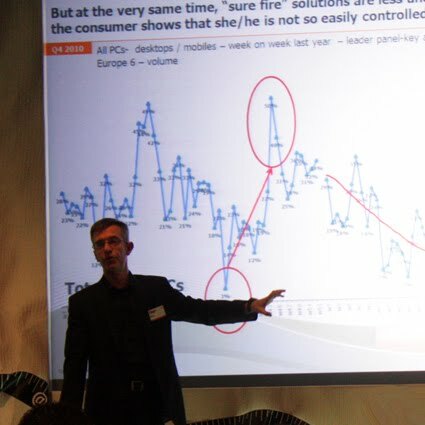 "Textiles and Apparel 2010: Power to the people means power to the brands"
Global Fashion Director of GFK Retail & Technology Pascal Bollon (seen in the pic above) talked about how fashion businesses must keep learning from their customers, much like the very successful fast fashion model, where companies keep an eye on what people buy in their stores, in order to know what sells and to produce more of it. We also heard that the more expensive an item is, the less chance there is people will be willing to buy it online. People still need to have real-person reassurance instead of a lifeless computer screen in front of them, when making an big and important investment buy. Makes sense. "The characteristics, lifestyle and perceptions of fashion consumers in Greece"
Ally Managing Director Nopi Romanidou (you've seen her before in this blog here) presented a research on the habits of fashion consumers in Greece. Great idea, bad execution. For starters, we were told the research was conducted through fashion-oriented websites. Not exactly a great way to secure an objective sample. Plus we didn't hear any info we wouldn't have guessed ourselves, which was kinda disappointing. 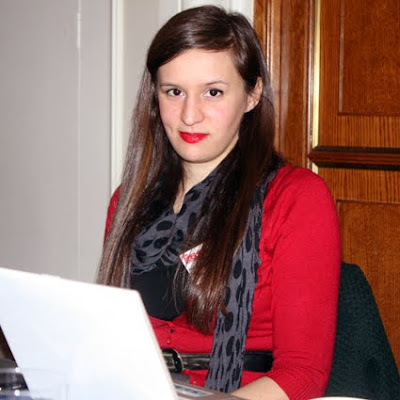 Ms Romanidou also dedicated a hefty chunk of her speech presenting us her own fashion-oriented PR business. "Fashion retail & consumer psychology: Looking for optimism lost"
Notos Com Marketing Director Nikos Aidinis, McArthurGlen Hellas General Manager Giannis Kasimatis, Raxevsky Commercial Director Konstantinos Koutsoumpos and Progressive PR General Manager Fotini Mpampanara were the panel members who took talked about what consumers are currently thinking and how brands must act in order to stay relevant to their customers. Among the things mentioned was how important it is to build a brand's identity and how difficult it is to do so in times of crisis. Brands attempting to build their own identity now are in a much more difficult place than those have already claimed their place in the consumer's mind. We also heard Ms Mpampanara say that fashion blogs have a long way ahead of them to prove their efficiency to PR firms. Well, I say that there are great examples of product placement in fashion blogs abroad that have already proven that. All it takes is some googling. "Informed decisions and growth strategies"
Entersoft Commercial Manager Tasos Patsilinakos and Digalakis IT Manager Antonis Motsovoleas gave one of the most useful presentations of the conference, presenting what an ERP (Enterprise Resource Planning) system is and how important it is for the retail fashion businesses nowadays. Really people, if you're a fashion business professional - even if your company is relevantly small - you are not allowed not to know what an ERP sytem is. If you don't, the wikipedia page is here. 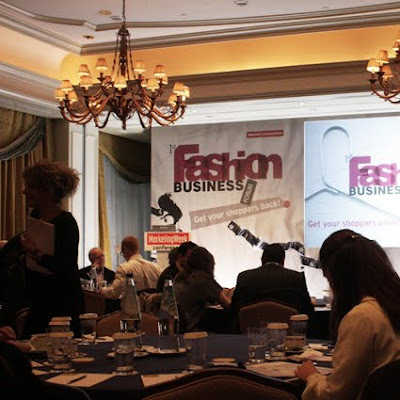 "Is fashion relevant to today's consumer?" 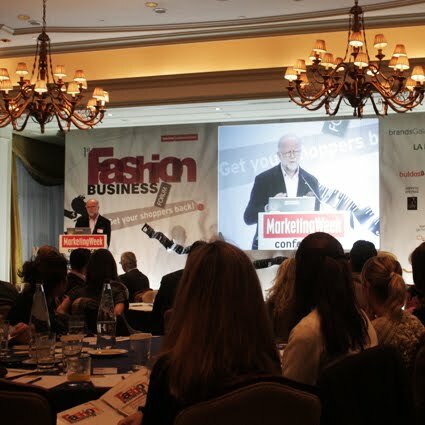 Sunday Times Senior Fashion writer and fashion business superstar Colin McDowell was the most entertaining speaker of them all. Mr McDowell said tons of quotable stuff like "we are all insecure, that's why fashion is so important [...] we use clothes to impress others" and "fashion is about giving people confidence, strength and the feel-good factor" and "it's not what comes down the runaway, it's what photographers and stylists can do with it". Everyone in the room must have enjoyed his presence, his brit wit, even the constant name-dropping, but I personally didn't find his speech all that useful for professionals. 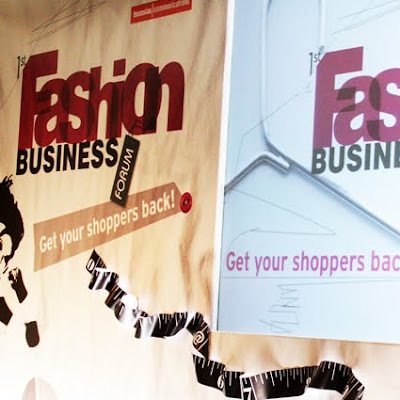 Founder of The Online Fashion Agency and The Online Fashion 100 Leon Bailey Green spoke about the way the internet has revolutionised the fashion business, by showing numerous interesting examples of real, successful fashion e-businesses. Not only retail-oriented ones but also some new ideas, like sites that rent designer wares. However, I was very disappointed when at some point during the speech, I turned my head around only to see that most Greek retailers were looking bored and uninterested, like the things being told were not relevant to *them*. Really? "Online fashion in Greece: buldoza.gr"
Buldoza.gr CEO and Co-Founder Panayotis Gezerlis and Fashion Product Manager Christina Lardikou presented their start-up fashion e-tail company and the ideas behind the whole concept, like having no stock of their own, offering free returns and the most impressive of all, "sell lower than retail or no-deal". Mr Gezerlis was the one who kindly invited 15 fashion bloggers to the conference, so extra kudos for that! "Consumers of today talk through the internet, do you hear them?" Fashinating CEO Alexis Mpallas presented how his site (that basically works as an intelligent aggregator that learns from the user's choices and manages to understand their taste through a complex patented algorithm) can benefit the retailers as well, by working as an online market research for their products. A brilliant Greek start-up that makes us proud! "Virtual Flagships - an evolution in luxury brand communication?" London College of Fashion Principal Lecturer Tim Jackson talked about how big brands are transferring their presence online and shared many important trivia like the fact that 8 million people become a fan of a brand on facebook every day. I was pretty much wasted till that time, so I didn't catch much. Greeks are stubborn. They absolutely hate being told how to do business, even if they actually paid good money to hear it from the best in the trade. Also, we must stop whining about what the government doesn't do for us and try to work around it. And frankly, I'm sick and tired of hearing that internet is the "next big thing". It's not . It has been here for a while and those referring to it as the "next" thing are probably those who have been left behind. To those I say: hurry up, chop-chop! I probably struck some people as anti-social and weird, having my nose buried inside my laptop all the time, reading other people's tweets from inside the room and tweeting about the conference myself. At least I had great company, with all the other bloggers there! No, we didn't plan to colour-coordinate, it just happened! Don't forget to take a peek at the official Boussias tweets and twitpics and also to check out the posts of Life Full of Fashion, Alecca Rox, Fashion Algorithms, Little Stylist, Life In Athens, The Way I Do, Wardrobe Recycle, Smells Like Fashion, SpottedM, EyeCandies, Posh Fashion, Ordinary Style Pulse, Sugahspank! and Ffffashionmixxxx. Also Elena was asked to write not one, but two great reports on the Fashion Business Forum that were published in xblog and LiFO, so if you can read Greek, click away! Lopi, we missed you! Was wondering what had happened! Exhaustion, I know what you mean... but now everyone around me seems to dropping off like flies, filled with flu! Your point on Googling is something worth mentioning, seeing as that's how I found out about you guys, Alecca, Elena, etc in regards to fashion week or Fashion in Greece! That says a lot about the power/potential of Greek fashion bloggers. AND, like you said, the internet is soooo not the new thing! When do you think retailers will introduce phone apps? Great round up doll! It was really great meeting you guys! μερσί για το ρεπορτάζ. έπρεπε να το είχες κάνει και εσύ μια ανταπόκριση στη λάιφο. το συνέδριο μάλλον ήτανε βαρετό απο ότι κατάλαβα απο τα όσα γράφεις. stating the obvious, αν και promising στην αρχή. ενδιαφέρον αυτό που λέει ο τσεκλένης για την χαμένη ευκαιρία αλλά αν σκεφτεί κανείς τί γινότανε πολιτικά τότε, δεν θα απορήσει.... βέβαια ακόμα και σήμερα δυστυχώς δεν υπάρχει όραμα στην ελλάδα, απο τη μεριά του έλληνα επιχειρηματία. κανείς δεν κοιτάει μακροπρόθεσμα...όλοι θέλουνε τα γρήγορα και εύκολα λεφτά (κλισέ αλλά αλήθεια). έτσι μετράνε την επιτυχία τους. και εδώ κολλάει αυτό που λέει ο ρακάς. παρτο αλλιώς έλληνα επιχειρηματία. να γίνει πιο ευέλικτος θα έλεγα. (αν και βέβαια θα ήθελα να δώ πώς εφάρμοσε τα όσα λέει ο ίδιος στην δική του εταιρεία). Πολύ ενδιαφέρον το...σεντόνι σου :)! Και πραγματικά εκτιμώ παρα πολύ και εσένα , και τα άλλα κοριτσια που ειστε πραγματικά δραστήριες, συμμετέχετε, έχετε άποψη και ενθουσιασμό! couldn't agree more with your last paragraph! Greeks do not want to be told what to do indeed! If you have to deal with closed ears and minds, in the end you don't attempt to open them, that's all! As i can see from my own environment, people in the wrong positions drag all of the others down! And this is the norm here in Greece! On the bright side, there are positive moves such as this forum. Thanks for the post, it was great reading your report! Enatxi ti na po.......apisteuto report!!!!! !Etsi prepei...alla ego oute sto panepistimio den krataga toses simioseis........bravo koritsaki eise mia logia tis modas!!!!! !Filakia see you around!!!! em, eida comment ennoousa...den xerw ti egrapsa, nomizw pws egrapsa post...anyway, filia! finally one more greek fashion blogger :) i really like your blog!